Effective immediately, the United States Mint will suspend the production of additional Presidential $1 Coins for circulation. The move follows public scrutiny of the program after reports of a surplus of more than 1.4 billion $1 coins stored at Federal Reserve Banks. The suspension was announced by Vice President Biden and Treasury Secretary Timothy Geithner as part of the Administration’s Campaign to Cut Waste. 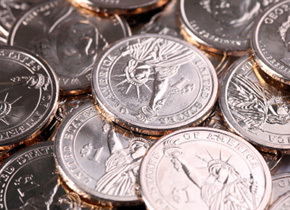 Under existing law, Secretary Geithner has the authority to “mint and issue coins… in amounts the Secretary decides are necessary to meet the needs of the United States.” The number of excess dollar coins in storage are already expected to meet demand for more than a decade. During 2011, the US Mint struck 297,360,000 Presidential Dollars for circulation at the Philadelphia and Denver Mint facilities. Since the start of the program in 2007, production for circulation has totaled 2,376,250,000. Six different bills had been introduced in Congress which sought to abolish, limit, or suspend the production of additional $1 coins by striking or modifying the requirements set forth in the Presidential $1 Coin Act. A single bill had been introduced which instead sought to phase out $1 bills in favor of the $1 coins. I wonder how this will affect the First Spouses gold program and the Native American $1 program. Apparently the minting of numismatic coins would still continue, so it appears that the gold coins will still be minted, and the Mint’s annual proof and mint sets are safe. But what about the made-for-circulation coins in the rolls and bags? I worry for the Native American $1. The legislation for the coin states that 20% of the total $1 production (both NA and Presidents) will be the NA dollars. If no circulation strikes of the Presidential dollars are made, will the circulation NA coins also be stopped? I certainly hope the First Spouses gold program continues for the sake of those collectors. Also, the Native American coins are very attractive and should likewise continue. The Direct Ship program, however, will probably be eliminated as being unnecessary. It great a that they will make 4 presidential 1 coin designs for collectors.they dont need bills to stop the designs.the public is not use the dollars coin & they dont care who is on the coin.so it best to make the coin for collectors. i dont want the mint to stop making 4 presidential 1 coin designs per year. So if this holds true the First Spouse Gold coins will also be discontinued, since they are based on the Presidential coins and the same bill? If this does happen maybe the US Mint will be able to issue coins in the year that is stamped on the coin(we’ll see 2013 coins in 2013).